Self-proclaimed “audio drag for ego slobs,” Brooklyn’s own Gustaf is a band playing psychedelic art-punk, ready and gearing up to conquer the world. Since its inception, Gustaf has been taking over the Brooklyn music scene, and are currently getting ready to head out for their month-long upcoming US tour. 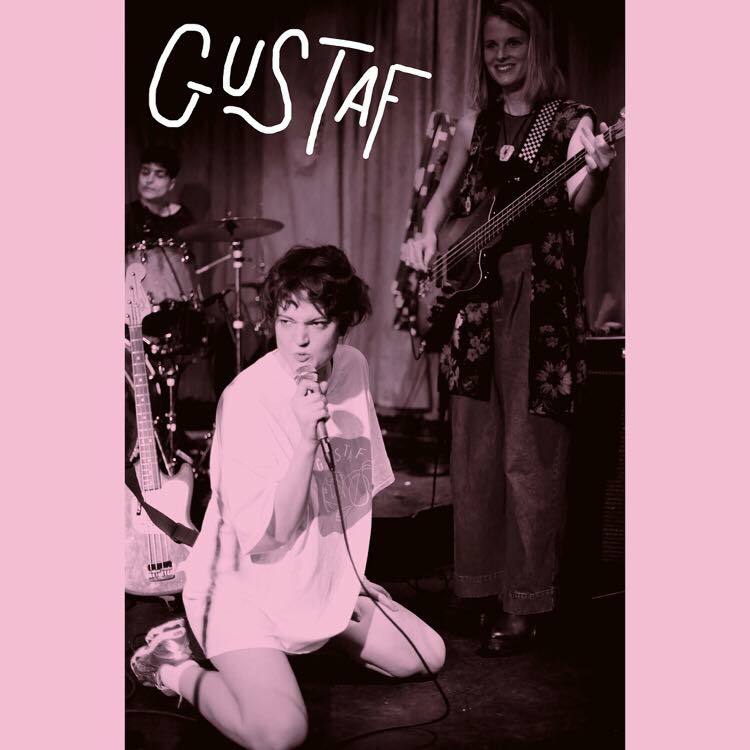 Gustaf is founded and fronted by Lydia Gammill (of Total Slacker and The Wants) who draws her inspiration from groove-based post-punk artists like ESG, Alan Vega, and Jonathan Richman. Lydia took the time to sit down with us this week and answer all our questions about the concept and formation of Gustaf, as well as their upcoming US tour. Where did you grow up, and what types of music did you grow up listening to? I grew up in Massachusetts, outside of Cambridge. I’d fall asleep to the radio – either KISS 108 or Oldies 103.3 – and spent a lot of Tuesday nights hanging out at the local open mic night at Veggie Planet in Harvard Square. Most of my childhood memories are set to Al Green, Patsy Cline, and Mildred Bailey. I was always looking for some mysterious indie underground that was just out of reach when I was a teenager, so a lot of my time in high school was acting like I knew more about music than I really did. Your band members are listed as Lydia Gammill, Tine Hill, Tarra Thiessen, Angela Tornello, and Vramshabouh Kherlopian. Do you all play every show together or is it more of a revolving cast? That’s the core family and we get subs from time to time. I used to work as a talent buyer and got so frustrated when bands would say no to shows because they didn’t think they were ready etc. Because in reality, every show is an opportunity to learn something new about yourself and the material. So when I started this band, I had the intent to play out as much as possible because I wanted to become a machine as a performer, someone who felt comfortable and could deliver in any situation. As much as I hate having an unsuccessful or bad set, I always tell myself after, “This is good, I’m growing.” Kind of like how a virus grows stronger for each antidote it learns to fight? I’m also lucky that I have a lot of talented friends who are willing to help out when someone can’t make a show. Since I’m so indecisive when it comes to finalizing material, I like to hear my friends’ interpretation of the material. I would also like to take the opportunity to thank the whole Gustaf family: Sandy Davis, Lyzi Wakefield, Lisa Mayer, Mattie Safer, Madison Velding-Vandam, Jason Gates, Steph, plus the countless others who have dug me out of trouble. It sounds like you all have a really great musical bond/connection! How did you come up with the idea for Gustaf? Last year, my bandmate Tarra asked me to help drive her van down to SXSW because her other band, Ex-Girlfriends, needed it to tour after SXSW. I said I would, on the condition that I could play shows on the way down (I didn’t have a band at the time). We recruited Tine and Angela from Ex-Girlfriends, and Vram’s band The Big Drops had to back out of SXSW, so he agreed to play guitar. Like I said, I had hit a wall in writing my own material so I started fresh by trying to write minimal songs with an elaborate ego layered on top that felt separate from myself but still cathartic and fun. If I didn’t have the deadline of booking that tour or Tarra encouraging me, I don’t know if any of this would have ever happened. Supportive bandmates are the best. In your bio, you talk about androgyny as playing a large part in your bands’ persona; can you explain that a bit? Gustaf’s tagline is “audio drag for ego slobs.” “Audio Drag” is a concept that we took from Laurie Anderson, where she uses a pitched down vocal transformer. I saw her perform at Town Hall and she said it came out of when she was touring with William S. Burroughs, who famously hated women. Anderson was fascinated by him and used audio drag as a way to bridge the gap between the two of them and embody another voice. Similarly, Gustaf was a way of me trying to get outside of myself. I wanted to make something that could be cathartic for a wide range of people. The “glorified mania” / indignant self-absorption of Gustaf is a universal monster rumbling within the depths of all of us; it’s not meant to be tied to one identity. We’re all susceptible to the disease. I also happen to have a lower vocal range and mostly wear pants, so it felt like an appropriate way to market us in a world where “female-fronted” is (somehow) a genre. Totally agree with you about the “female-fronted” genre thing. Just because a band has female vocals or females in it, it seems to already be boxed into a genre. What’s your songwriting and lyric writing process like? Are your lyrics set in stone or is there a bit of improvising involved? Usually, it starts with a beat and a bass line and I build from there. The more we play the songs live, the more the form takes shape. Gustaf is in very minimalist in its technical approach and maximalist in its persona. I started writing Gustaf songs as a way of escaping myself. I was laboring over my material too much and wanted to try making one or two simple decisions and sticking with them. Lyrics are pretty much the same in the recorded world but our live shows leave room for me to improvise depending on the room. Now that we are planning a record, it’s been an interesting process figuring out how to fuse the two worlds. You used to play bass in the band Total Slacker; what made you decide to switch from rhythm section to front-woman? I’ve always written my own music and had various side projects over the years. This was just the first one that stuck, partially because I had no choice but to put it out there if I wanted our tour to come together last year. I also play synth and sing in the band The Wants with my longtime friend/bandmate Madison Velding-Vandam. I owe a lot to him; he taught me how to think ambitiously and push the limits of what a project can or should be. You all clearly work hard and it is definitely paying off! What is Gustaf’s favorite activities aside from playing music? Tarra and Vram enjoy public displays of affection and late-night ice cream, Tine is the queen of NYC’s service industry, Angela is probably on a motorcycle, and you can find me walking around NYC, looking at buildings, trying to embrace the nostalgia of the present. Do you have any new recordings or videos coming out we should know about? We’re using this upcoming tour as a month and a half long pre-production process. We’ve got some time booked in a couple studios on the road and are hoping to come back and lay down the first LP in April. Did you book the whole upcoming tour yourself? Yep! Tarra and I did most of the work. Tarra has done an insane amount of touring over the years with Sharkmuffin, Kino Kimino, and Ex-Girlfriends and was able to reach out to old contacts. A lot of this would’ve been impossible without her. She made a zine about booking DIY tours called “Check the Spreadsheet,” which she’ll be selling at our shows across these fine United States. I recommend you pick up a copy yourself. Very cool! What area of the country are you most excited to travel to on tour? I haven’t spent much time on the West Coast so that’ll be exciting. We’re also playing Marfa, which I’ve been told is a fantastic weirdo art town in Texas. What will you all be touring in? Do you own a van? Last year we toured in Tarra’s passenger van, Abbey. This year, I’ll be renting a car because, after insurance/repairs, it was the better bet. Okay, final question. What is your favorite place to grab food on the road? We had an infamous run-in with a Taco Bell in Florida this last September. (Check out our Visit to Tampa Sessions for more info on that). So I’m thinking we’ll be more prudent with our diet. We are big fans of the yellow deli and that magical bread they have. My weakness is gas station trail mix.